Goddess Meenakshi, the reigning deity at the Meenakshi Amman temple in Madurai, loves malligai so much that she literally bathes in the fragrant flower six times a day. In the spring festival of Chithirai, it appears as if all the jasmine produced in this temple town in Tamil Nadu ends up adorning her abode, from her garlands to the decorations on her mythical beast yaali, to her poo-pallakku (floral palanquin), which will carry her to her wedding with Lord Sundareswarar. The couple—reincarnations of Lord Shiva and his consort Parvati—live happily ever after, the jasmine on Meenakshi’s thirumangalyam (nuptial pendant) marking their contentment, peace and love. Also, perhaps, romance and sensuality. The Indian jasmine, poetically called “moonbeams”, has an elevated status among other flowers. Considered sattvic (pure) and auspicious, it has been mentioned in the Vedas, the Mahabharat and Kama Sutra, as well as in Sangam literature. It is used for almost every ceremony related to pregnancy, childbirth, weddings, royal coronations, sometimes even in death rituals. 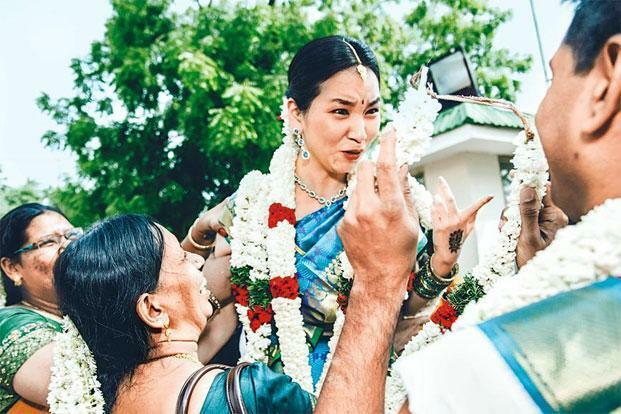 Jasmine flowers were the cultural giveaway at the wedding of a Korean girl to a Tamilian man, documented by photographer Mahesh Shantaram. Photographer Mahesh Shantaram recalls the wedding of a Korean woman and a Tamilian man that he photographed. “Over the past eight years, Indian weddings have transformed immensely due to the cross-pollination of traditions. Mehndi and sangeet are no longer out of place in south Indian weddings. However, the sight and smell of jasmine still gives the occasion its sense of place and identity,” says Shantaram, adding that the flower is as symbolic of a south Indian wedding as the red garment is of a north Indian bride. The fragrant white flower, ubiquitous on the braids of ordinary women and a love toy in Tollywood movies, is simultaneously a luxurious ingredient that makes its way from the flower fields of Tamil Nadu to the perfumeries of Dior and Chanel in France. Though jasmine is grown all across the subcontinent, the Far East and even parts of North America and Europe, Madurai is its motherland—it has played a vital role in the social fabric and economy of the city from time immemorial. Even today, the flower from this region is preferred over any other from around the world for its 36-hour fragrance, pure whiteness and thick petals that don’t droop or wilt for hours. Raja Palaniswamy, fondly referred to as the “king of jasmine” by his customers, would know. Born in a village near Coimbatore, he moved to Madurai three decades ago and went on to set up India’s largest manufacturing units in flower processing, most of it jasmine. Palaniswamy specializes in producing high-quality jasmine extracts such as essence, wax and oil that go into the making of several well-known perfumes around the world, including Chanel No.5, and Dior J’adore; personal-care products such as those by Lush, Kama Ayurveda and Goodearth; and even in high-end paan masala like Rajnigandha. Almost 95% of the jasmine grown across 900 acres in Madurai is used in garlands for ceremonies, weddings and so on; the rest of the 489-tonne annual yield is used for extraction by the global fragrance and spa industry. “It’s like a stock market; prices fluctuate daily depending on the season,” says Palaniswamy, who owns four processing units in Coimbatore, Madurai, Bangalore and Agra. “Flowers that cost Rs.100 per kilo could go up to Rs.102 per kilo the next minute,” he says. During peak festival season, prices have shot as high as Rs.600 per kilogram. 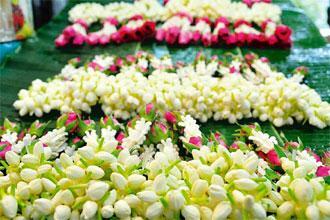 Plucked before dawn, mostly by women, the flower buds are in flower markets by 6am, in jute or palm-leaf baskets. Middlemen-traders sell them to garland makers and flower sellers. Strings and loose flowers are wrapped in banana leaves, tied with banana twine—a trend that’s sadly changing owing to plastic bags and cotton thread—and sold on the streets of Madurai the same day. Bulk orders of its commercial varieties—sambac, auriculatum and grandiflorum—are packaged and transported to other cities and countries in thermocol boxes lined with tekno-ice packs to keep buds fresh. 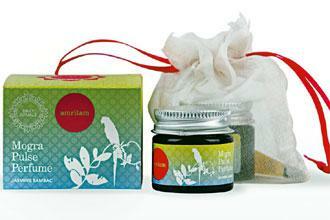 Jasmine extracts are often used as ingredients in beauty and spa products like oils, soaps, creams and fragrances. The Madurai malligai was given the geographical indication (GI) tag—the second jasmine after the Mysore malli—only as late as 2013, mostly through the efforts of the Madurai Malli Farmers’ Association, Kurinji Vattara Kalanjiam and the Development of Humane Action (Dhan) Foundation, Madurai. 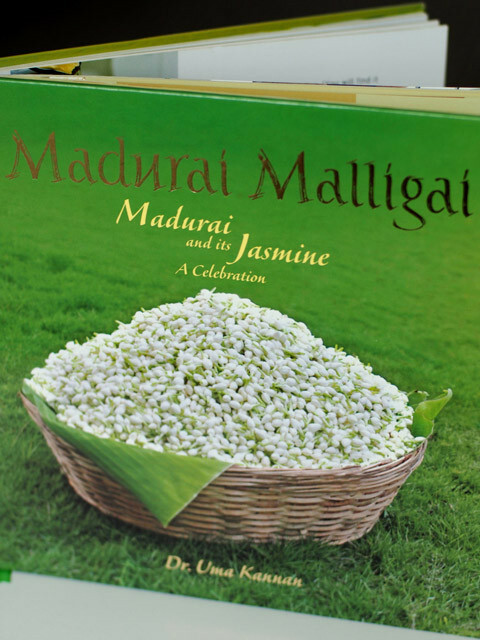 “The GI tag gave the flower its due credit and respectability,” says Uma Kannan, vice-president of the Thiagarajar College in Madurai, and author of the book Madurai Malligai: Madurai And Its Jasmine, A Celebration. One of the key supporters in the farmers’ efforts for the GI tag, she’s a malligai aficionado and has spent hours with farmers, flower sellers, shopkeepers and garland weavers studying the life cycle of the graceful bloom. Kannan was instrumental in organizing garland-making classes for women. “Women were given the labour-intensive, monotonous job of tying jasmine strings, which barely yielded a few rupees per metre, while men dominated the garlands market, which needs less labour but fetches up to Rs.300 per garland,” she recalls. Recognizing that modern young women no longer wear jasmine strings in their hair, her classes—organized after college hours by the Indian National Trust for Art and Cultural Heritage (Intach), that Kannan is associated with—also teach innovative ways of using the flower, such as in home décor items, bracelets and personal products. “I wish the market was more organized so that these women’s lives would also bloom along with the industry; they are constantly in debt to middlemen. Even then, they never complain. They say tying jasmine strings gives them a lot of peace. Who knows? Perhaps it is due to the benefits of aromatherapy,” she muses. This benefit is endorsed by beauty expert Blossom Kochhar, who manufactures curative oils. “Long considered an aphrodisiac, jasmine’s anti-depressant properties help overcome a range of sexual problems which are psychological, rather than physiological or reproductive. Jasmine essential oil can be used in bath water, in your diffuser or as a drop behind the ears or on the wrist,” she suggests. Besides its mood-uplifting and confidence-boosting benefits, jasmine is also great for the complexion. Besides its mood-uplifting and confidence-boosting benefits, jasmine is also great for the complexion, says Ipsita Chatterjee, an Ayurvedic doctor at luxury beauty brand Forest Essentials. The brand uses Madurai’s yuthika jasmine in various beauty products. A steam-distillation process at their production unit, designed according to Estée Lauder’s global standards, separates the floral water from the pure essential oil, which is used in the products. “The essence of this flower helps improve the skin’s elasticity, balances oil production and evens out the skin tone,” says Chatterjee. Madurai’s jasmine is also used in the natural, Ayurvedic-based concoctions at beauty brand Iraya. Transported to their unit in Nagpur, the flower essence is combined with Kumkumadi oil and about 40 other herbs and undergoes several processes over days before being shipped out to 110 spas and retail outlets across the country. “I was inspired while working in France,” says Iraya’s founder, Rahul Kale. “They make home-grown traditions relevant to modern consumers and that’s something we can do with our treasure trove of wellness knowledge in India too.” His Nagpur team uses two kinds of jasmine and collaborates with two cosmetology colleges in the city to develop innovative formulas for face creams and personal-care products. “There is an unmistakable element of luxury in the scent of jasmine,” says Debabani Guha, trainer at the French-based brand L’Occitane, which offers soaps, shower gels and body lotions along with its very popular perfume Jasmin & Bergamote EDT (Rs.4,600). Jasmine is, in fact, used in several iconic perfumes by luxury brands such as Bulgari, Estée Lauder, Tom Ford and Michael Kors. “It’s always linked with happy occasions when you need to dress up,” Guha adds. Jasmine extracts are often used as ingredients in beauty and spa products like oils, soaps, creams and fragrances. On his part, Vivek Sahni, founder of Kama Ayurveda, testifies that jasmine-based products are guaranteed best-sellers at their airport counters. 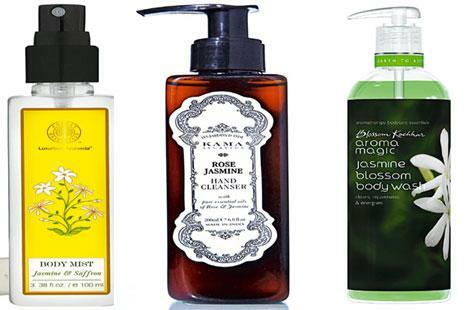 “Asians, especially Japanese and Indians, are obsessed with jasmine,” says Sahni. Though his brand makes body scrubs and creams that aren’t heavily scented, his team is now developing certain products with enhanced fragrances to cater to the Indian audience, which prefers strong scents. Jasmine is also used in food flavours, such as in jasmine mithai (sweets) and sherbet. Kannan mulls over the memory of a jasmine-flavoured, 100% natural ice cream she once ate in the US. “It was their top-selling variety,” she recollects. Back in Madurai, flower women make their way through the streets at dusk, calling out for buyers for their soon-to-expire stock of flower strings. Seductive, mesmerizing and heady, the malligai scent lingers in the air behind them. First published in the November 1, 2014, issue of Mint Lounge. An extraordinary post, Aekta, ethereal as it may be, it is passionate and very alluring. Wish I could share it on Pintrest too!